Escape to the Indian Ocean, spanning from South Africa to southwest Australia, where exotic beaches meets timeless beauty. Surround yourself with sparkling emerald waters, idyllic scenery, intoxicating cultures, and delectable cuisines of the amazing islands, like Maldives, Mauritius, Seychelles, and Sri Lanka. Maldives truly has that wow factor travelers are searching for, with over-water bungalows and villas lining the spectacular white sand beaches. 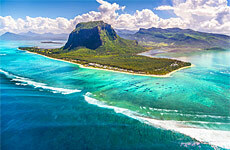 Mauritius is a large volcanic island, abundant with waterfalls, coral, and mountains. An underwater paradise, travelers can swim with the dolphins and snorkel in the world-class coral. Just south of the equator, Seychelles is an archipelago of 115 islands. You'll find lush wild forest and diverse flora and fauna. Sri Lanka, known for its spices and trade between Europeans, Indians and Arabs, is primarily made up of tropical forest, with tea plantations, white sand beaches, and abundant wildlife, including elephant sanctuaries. Whichever island you choose, you're guaranteed to feel like you've been swept away to a tropical paradise.